A friend spotted this woman at the Festa Italiana, and suggested that she would be a good blog subject because of a) her outfit and b) because she seemed so full of life and was enjoying herself thoroughly with her friends and family. 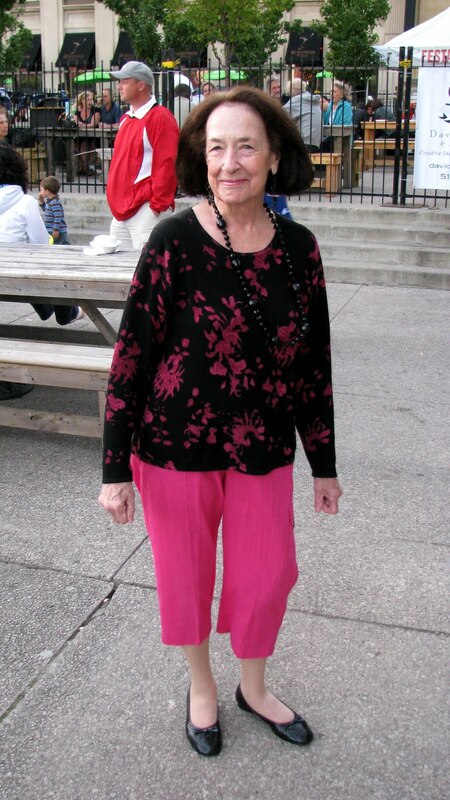 After speaking with her, I decided I would have taken her photo no matter what she was wearing, although I think she looks great in the pink and black, especially with the jet bead necklace and ballet flats. She was just lovely, and thrilled to be singled out for a photo. I'm pretty sure she said she was 87 (if I'm adding a few years, I apologize, but I know she is in her 80's) but she had more spark and personality than many people half her age. One of the reasons I enjoy doing this blog so much is that it provides an opportunity for meeting people like her! Someone has rightly said that Age is just a number. This old lady has proven this saying right. We all should take lesson to live a life to the fullest from this lovely old lady.